After the big success of ARC August in 2015, Octavia and Shelly of Read. Sleep. Repeat. are back with a Spring edition—ARC April. You have until April 15th to sign up! I urge you to, especially if you have ARCs you need to read! Also, there’s a lot of wonderful readers joining in. Another month, another set of ARCs to get through, and why not partake in ARC August? It’s gonna be a busyyyyy April for me, and let’s all cross our fingers we get all our books read! There might be add-ons depending on how fast I get through this pile, but these nine ARCs are my main priority for ARC April. 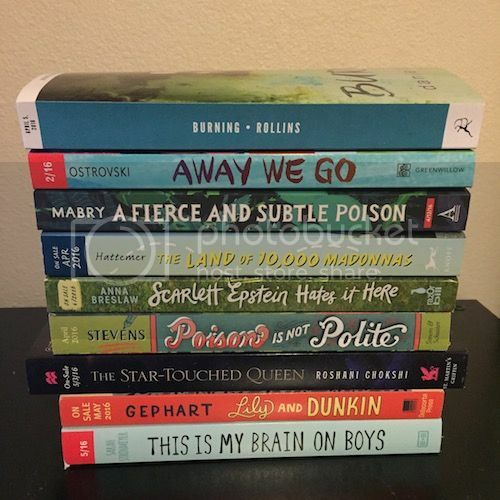 Have you read any books from my ARC April pile? Are you looking forward to any of them? The Land of 10,000 Madonnas, Scarlett Epstein Hates it Here and This is my Brain on Boys sounds really good! I’m taking part too! I don’t have many ARCs to get through but it’ll be good to get a head start before they start building up again. I’m so excited to see what you think of these, Willoughby! (especially the Star-Touched Queen because I WANT IT.) Also any title with the word poison in it? Sounds good to me. I have to finish my ARC April post right now. I’ve been putting it off and I don’t even know why! I’ve read A Fierce and Subtle Poison! I quite enjoyed that one, because I liked the writing and the setting a whole lot. It’s a pretty quick read, and very atmospheric, and strange in a compelling way ;) I’m also going to be reading The Star-Touched Queen this month, and I cannot wait! I haven’t read any books from your TBR but we have The Star-Touched Queen in common! There should just be a giant read-a-thon for it, to be honest. My friend liked AFASP so I might pick that one up after ARC April. As for Scarlet Epstein, I’ve been in a mood for contemporary lately so I’m eagerly waiting for that one. Good luck!